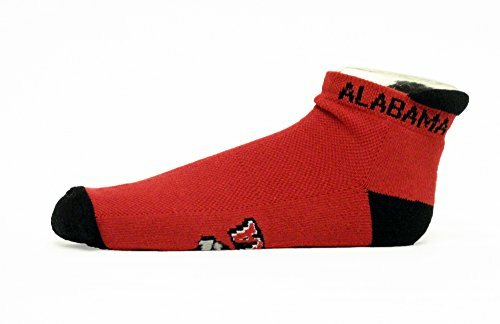 Alabama Footie Socks are ideal for tennis, running, hoops. Just about all activities or just hanging out. The extra padding and superior durability make them a favorite of all that who wear them. With shorts or sweats or jeans these Crimson Tide Footies are the perfect compliment to any casual footwear. With the added, team color coordinated heel tab for ease in putting on your Footies, you are ready to run to the game or the couch to cheer on the Crimson Tide. The contrasting, alternate official team color and Logos complete the oh so comfortable, casual look.